Robert Audi's aim in this book is to introduce an ethics of conducts to show that how our actions, intentions and manner of treating others ought to be interrelated in order to constitute a good conduct. He starts with Kantian humanity formula of his categorical imperative that we must treat persons as ends in themselves and never merely as a means. But he goes far beyond Kant's in constituting his ethics of conducts. He argues that neither utilitarianism nor Kantianism nor even virtue ethics could provide broadly enough frameworks for realization of multidimensional conception of moral responsibility in establishment of moral life. Conduct is a three dimensional conception referring to "the performance of an action of a certain type, for a certain reason, and in a certain way. Clear cases of conduct are treating persons as ends and treating them merely as means" (1). Treating persons as ends and treating them merely as means as two subtle properties of treatment can be explicable without appealing to moral concepts so that they can provide a descriptive, factual and objective standards by which we could justify our moral judgments. Through this line of thought Audi shows that normativity of actions supervenes upon such treatment properties. He continues that our knowledge of normative properties is based on grounds for knowledge of such treatment properties (6). Knowing or justifiedly believing that such a descriptive property has been instantiated can be achieved through common-sense observation of the situation as enhancing well-being of or inducing harm to other persons (7). The book then has two main parts: the first part is dedicated to exploring the meaning of using something merely as a means and the second part to scrutinizing the concept of treating persons as ends in themselves. Audi distinguishes between three kinds of instrumental treatment of others: To treat the other person solely as a means, to treat her merely as a means or to treat her as a mere means. To treat someone solely as a means is to conceive the person as a means to an end while the agent may dispose to value the person's well-being. To treat someone merely as means is to conceive the person as a means to an end while the agent is disposed not to value the person's well-being. To treat one person as a mere means, the agent is unconcerned with anything about the person so treated that is not relevant to the desired end and the agent does not value the person as more than a means. While it seems that using other persons, as means to ends is unavoidable, but regarding these distinctions it would be clear that only the latter view about others, which includes merely instrumental treatment is objectionable (21-27). As defined, conduct refers to not just what we do but also of why and how we do an action. So if our conduct is three-dimensional account each of its dimensions can be vulnerable to make the conduct wrong. Wrongness reduces to a notion like treating other persons merely as means; and this notion is prima facie objectionable since it includes the notion of treating persons as mere means. Nevertheless, the notion of treating persons as mere means, is objectionable since it is surely plausible to see that those who tend toward treating others as mere means are often among the callous and cruel agents quite willing to hurt others where it advances their own ends (59). Then the conduct becomes prima facie wrong if either the agent's motivation to act, her manner of action or her very action is done on the basis of merely instrumental concerns without any disposition to appreciate any non-instrumental concern (54-57). The second part of the book dedicates to explanation of the concept of treating persons as ends in themselves, the concept which shows the positive part of the formula of humanity. Audi remarks four main points in chapters 5 to 8 respectively: First, doing something that is good for the other person does not entail that the person has been treated as an end in herself. Treating someone as an end includes some sort of caring attitude, benevolence, and altruistic behavior towards her (86). More specifically, the good of the person (her well-being) ought to be concerned by the agent in his conduct. Second, treating persons as ends requires paying attention to each particular happiness and wellbeing. When the happiness of persons in general or aggregated of happiness for all persons is the only concern of the agent, it would be possible that many people be treated as means towards a social aim (110). Third, end-regarding treatment of persons concerns personal goodness which is subjective as well as objective. Objective goodness concerns the person's pleasure and pain lessening. However subjective goodness includes the goods, which the person believes as good for herself according to her own interests and autonomy. A main sign of subjective good may be the one's consent for being so treated (120). Fourth, the famous biblical commandment to love your neighbor as yourself can be interpreted as an injunction directive to treat persons as ends in themselves. The command makes sense when we have the ability to love voluntarily, which seems impossible. However through education and by an exercise of self-monitoring combined with self-understanding we can learn our heart to care others as ends in themselves in an agapistic manner (147). 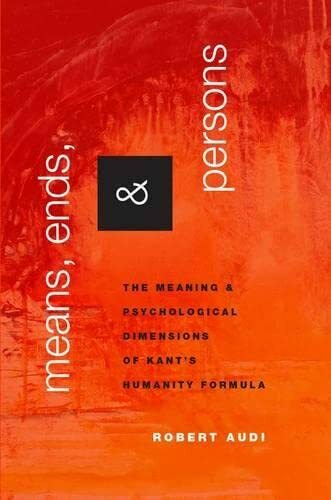 In this book Audi tries to present a new interpretation of Kant's humanity formula in order to establish a cornerstone for morality, which can encompass virtue ethics, consequentialism and Ross's intuitionalism as well. He thinks that the humanity formula is describing the descriptive formulation of normativity. "The reason-providing power of pain gives it great normative significance—enough to make it quite appropriate to speak of something's being moral (or normative) in upshot as a kind of normativity… But in content, the concept is not deontic or axiological; nor is it normative in any other contentual respect: its normativity is not internal to the content of the concept but a consequence of its application" (p.89). What seems strange in Audi's account is the emergence of normativity from application of some descriptive concepts. Alas, I found no clarification for this important claim in this book. Nevertheless I highly recommend reading this book to all moral philosophy scholars who concerns Kantian ethics. The book is enriched with several nuances and subtle examples. The last chapter of the book which contain the relation between commandment for love our neighbors as ourselves and its relation to Kantian humanity formula is really insightful and worthy of further theological and philosophical accomplishments.